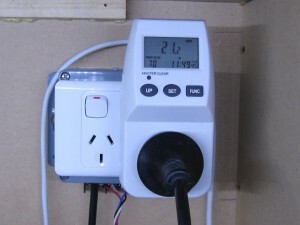 This image shows a power meter plugged in to one of our Fire Safety Cutoff controllers and monitoring power used by a couple of computers and accessory equipment. As this equipment runs 24/7, the meter has allowed us to reduce power overall power use and easily save more than the power meter cost. We have the Power Meters for sale here. Back then there was not much available, I had to get them in from Europe, they had “funny connectors” requiring adaptor leads and they were expensive. It also had a habit of occasionally forgetting the running total of power used; so you had to write it down regularly. In May 2007 electricity was costing us about 25 cents per unit when you include unit cost, line charges and tax. Currently (November 2013) we are paying closer to 32 cents per unit. The new meter is smaller, much cheaper and easier to use. Simply plug it in to the power outlet and plug the appliance in on top. 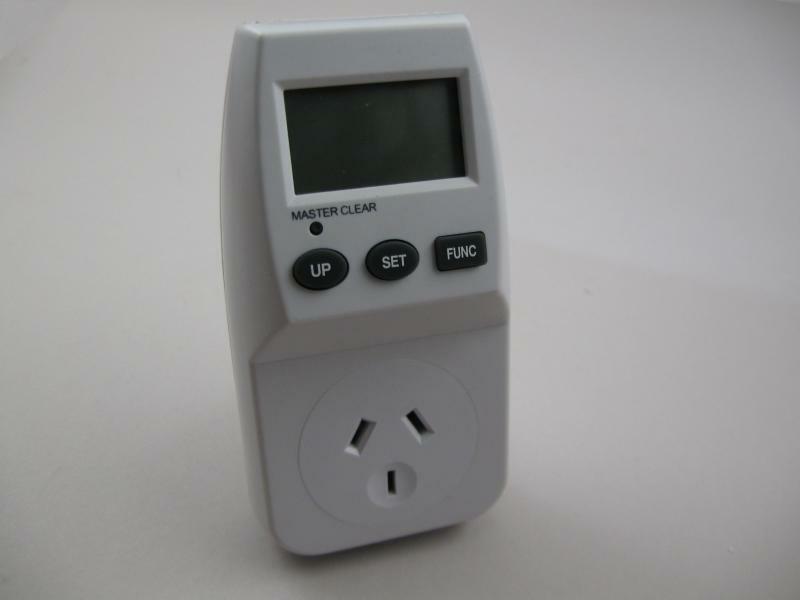 The meter LCD will display voltage, power, accumulated power used and cost since last reset. Note: you have to set the unit cost before it will record the cost of power used. 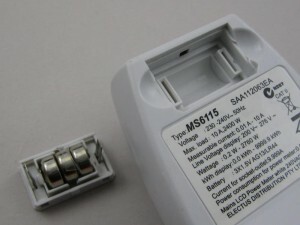 When you get the meter you have to enable the battery by removing the small plastic divider between two of the batteries. Be sure to put the battery holder back the right way around. There are some angles on the corners but they are quite small. When not using the meter, leave it plugged in somewhere. This will make the batteries last for years, rather than just months. Follow the instructions provided to set the power unit cost and the time and date. If the power reading is unstable you could try measuring the load of each item and all together as a total. One thing you could try would be to run a fan heater on low (about 1000W). Measure the power draw of the heater on its own and then plug in the computer and monitors etc. so that you are reading the total power draw including the heater. Subtract the heater load. This may give a more stable result. I haven’t tried this yet so I don’t know if it will work. I noticed that many wire-wound plug-pack power supplies (the heavier ones) are not very good. 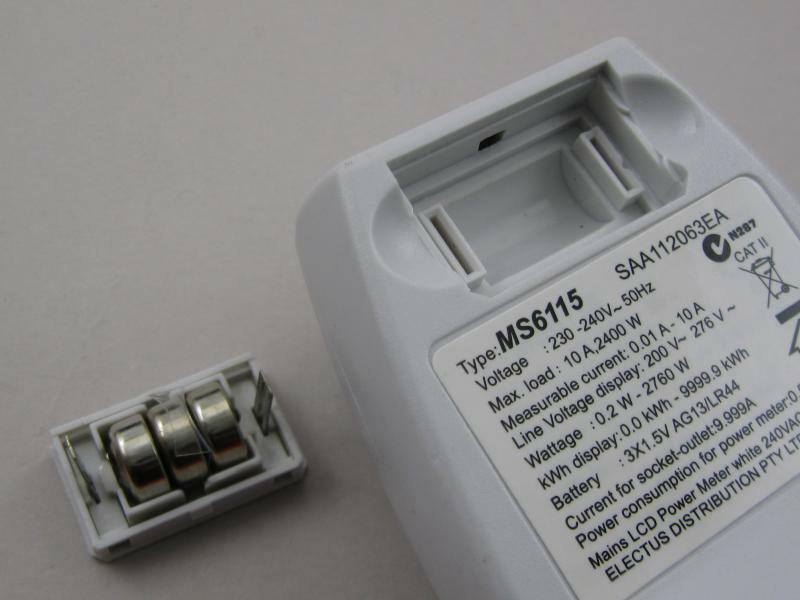 In many cases the losses in the plug-pack seemed to be equal to or greater than the loading of the appliance they were powering. Some light-weight switch-mode plug-packs that I’ve tested are much better. 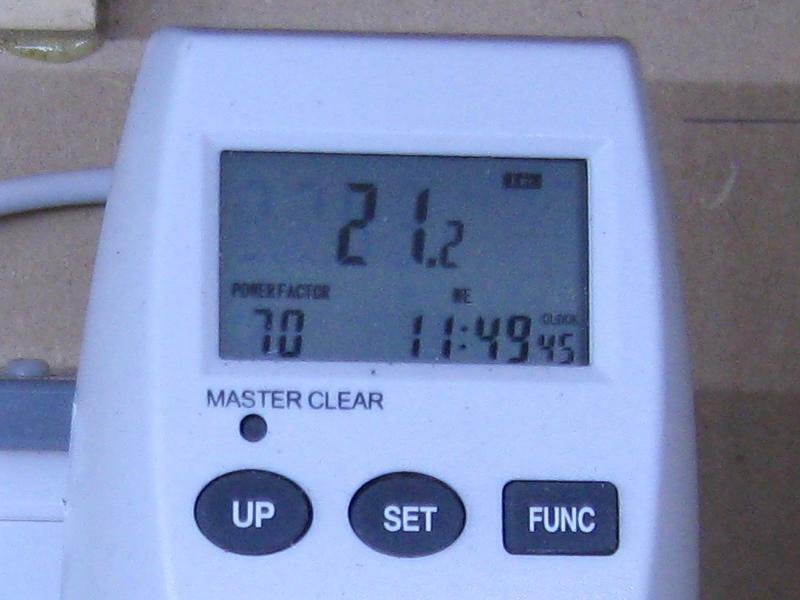 The power consumption with no load applied was almost zero or too low to measure easily. I did find one brand of switch-mode plug-pack that was less efficient than most older wire-wound plug-packs. It runs very warm even with little or no load connected. The washing machine uses more power when it’s plugged in and sitting on standby (off) than it does washing. 15 watts on standby is about 1/3 of a unit per day; almost $20 per year while it’s turned off. If it does 5 loads of washing per week, it uses about 35 units of electricity per year; $5 to $6 per year. This doesn’t include water heating if you use hot water for cloths washing. In this house we have a standing load or phantom load of about 250 watts. This is about 2280 units per year costing over $730 per year. 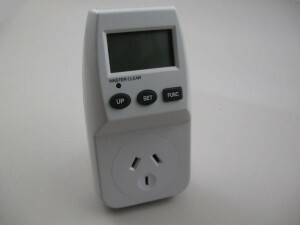 That’s $450 wasted each year by clocks, plug-packs and appliances on standby. Power factor (PF) is the timing relationship between voltage waveform and current waveform. If they are in sync the PF is 1.00. Generally, only heaters and old incandescent light bulbs have a perfect PF of 1.00. For a refrigerator, a PF of 0.30 (30) is not very good. This is due to the compressor being an inductive load. A poor power factor (less than 1) can mean that you pay for more power than you actually use because the the current draw is higher to achieve the same useful power. Things like computers and monitors (switch-mode power supplies) cause a distorted current waveform which complicates the power reading. 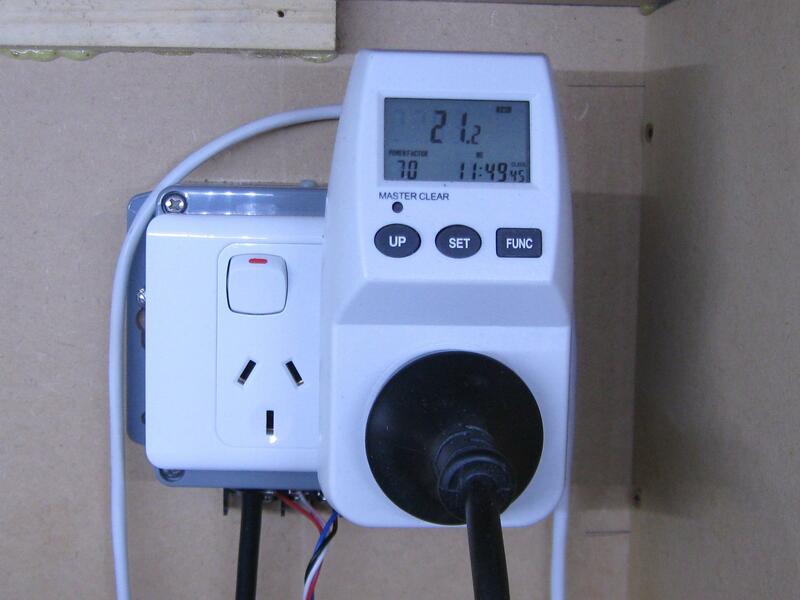 Some equipment is power factor corrected, but not much of it yet here in NZ. The image shows the power factor of 0.7 (70) for some of my computer equipment. This means we could be being charged for 1.4 times as much energy as the computers actually use. There is a UPS involved which may be inductive. The power supplies feeding the computers are switch-mode and do not include power factor correction. Overall, this is a pretty steady load and it looks like the poor power factor could be costing an extra $200-$300 per year for just a couple of computers. It looks like I will have to try some power factor correction.